4621 South Clarkson Street Englewood, CO. | MLS# 8911291 | Assist-2-Sell, We Sell Colorado - An Experienced Team of Discount Realtors. 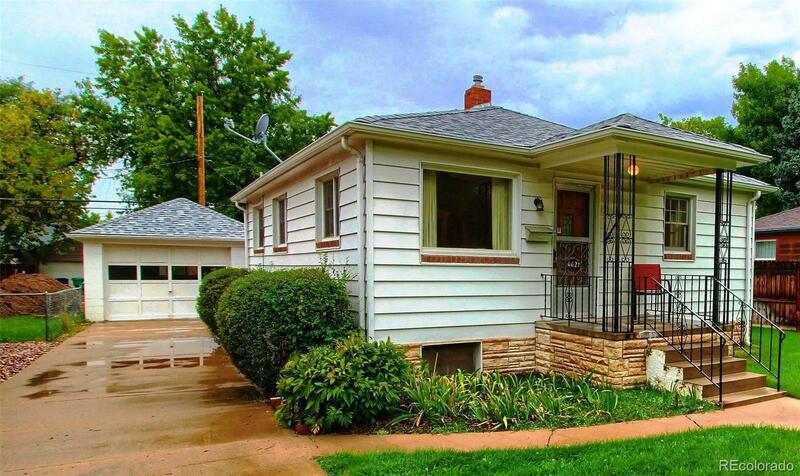 Delightful 1950's Ranch, great location across the street from Cherry Hills Village. Rare find, a one owner mid century home. Hardwood original flooring under main floor carpet, well maintained with moderate updates, original period interior architectural details and trim, arched doorways, coved ceilings, built-in china hutch, original wood doors. Full apartment in basement has private entry with kitchen, bedroom, living room, office/studio, real tongue and groove Knotty Pine paneling. Updated systems, seller has contracted for installation of a new electric panel. Large covered patio. Beautiful mature landscaping, sprinkler system. Oversize heated garage. Near Swedish Hospital, Arapahoe Community College, Denver University, RTD lite rail, River Pointe, Englewood Civic Center, Historic Downtown Littleton, for great shopping and excellent restaurants. You can use FHA 203k or Conventional fix up loan to update any way you would like. You'll love living here.